SACRAMENTO, CALIFORNIA (June 28, 2016) - The Pacific Challenge Series presented by PenneyLawyers.com will have one of its most coveted races of the year with Saturday's Ron Strmiska Memorial / Firecracker 100 at Stockton 99 Speedway. The $4000 to win race will also serve as the second round of the Tri-Holiday Series and is paired with a $2000 to win, 60 lap Stockton Late Model race along with Grand American Modifieds, Bombers, and Mini Cups. It all makes up for a big night at the 68 year-old quarter-mile bullring with fireworks capping off the festivities. Ron Strmiska, Sr. was known as the Manteca Missile and also known for his distinctive pink #90 race cars. He won both the 1978 and 1979 Late Model Sportsman track championships and the success transferred to his son Ron, Jr. and grandson Ross as well. Ross Strmiska will be one of many valley drivers competing against the touring stars of the PCS. 2014 PCS champion Mike Beeler of Modesto is one of those local drivers aiming for success at Stockton. Beeler is winless in 2016 through the first six races of the PCS but has plenty of history at 99. "Stockton's a special place," Beeler said. "A lot of racers have come through that track. It was really neat for me to start racing there 15 years ago. As a youngster I used to go up and watch Ron Sr. Really enjoyed hanging out with them and their family." Valley Springs' Tracy Bolin earned his first career PCS win at Shasta and would enjoy nothing more than to get his second win at Stockton. "It's my home track and you always get a lot of action there. So it's always a fun race," Bolin. "It would mean a lot to get one there." We're going to have a lot of fans. The Firecracker 100 is always a popular race," Beeler said. "The stands will be full...excitement will be high. It will be hot, tempers will fly, and it'll be a lot of fun!" Tracy's Jeff Bischofberger won his first career Super Late Model race when he won the SRL Southwest Tour race at Stockton last year. He hopes to add a PCS victory to the mantle on Saturday. "I like Stockton a lot. It's kinda my hometown since I went to high school in Stockton," Bischofberger said. "I like the concept of the track and the way its laid out. Its a lot of good fun racing!" Manteca's Jacob Gomes has four career PCS starts at Stockton including a win last season. He won the 2015 SRL championship and the 2016 PCS event at Madera in a busy 18 months for the young driver. Roseville's Eric Schmidt, himself a former Stockton track champ, topped Gomes for the win on Memorial Day weekend at Stockton. Upperlake's Jeremy Doss leads the PCS points standings with a win at Ukiah, three runner-up finishes, and a third place effort in the May race at Stockton. Beeler ranks second in the standings ahead of Doss' teammate Bischofberger with Bolin in fourth. 2015 PCS Rookie of the Year Cole Moore of Granite Bay rounds out the top-five. Manteca's JR Courage is sixth in the standings followed by Loomis' Chris Scribner in seventh. Lodi's Matthew Wendt won 11 of his final 14 Super Stock starts at Stockton before moving onto PCS. 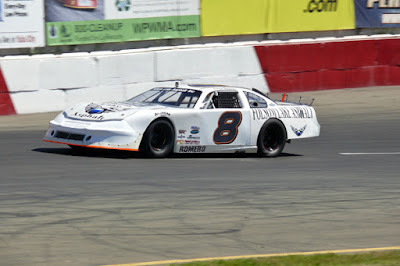 The Super Late Model rookie is up to eighth and ran sixth at Roseville last weekend. Hayward's Danny Malfatti and 2015 PCS and Stockton Tri-Holiday Champion John Moore round out the top-ten in the points. Elk Grove's Mike Hite, Eagle, ID's Travis Milburn, Modesto's Kyle Gottula, Stockton's Colby Potts, and Roseville's Shannon Mansch are among other drivers expected on Saturday night. Racing activities get underway Friday night with practice from 4 p.m. - 8 p.m. Pit gates open at 3 p.m. On Saturday pit gates open at 1 p.m. with first practices at 3:30 p.m. Grandstands open at 5 p.m. with racing scheduled for 6 p.m. General admission tickets are $20 for Adults, $15 for Juniors age 11-15 and Seniors age 60+, and Kids 10 & under are FREE! Fair night racing returned to Redwood Acres Raceway this past Saturday night for what was a thrilling night of racing action. DelReka Distributing presented A Night Of Destruction at the Acres which included the debut of pole racing in the roadrunner division. In spite of the late models having the night off, fans packed the grandstands to witness the other five divisions as well as the first boat race of 2016. Qualifying for the California State & Federal Employees Credit Union roadrunner division was led by Steve Paiment with a 21.074 lap. Dominic Vogelsang won the first heat while Bethany Rapp took the second. The 20-lap main event featured the debut of pole racing in the roadrunner division. Drivers had to drive a complete circle around two giant tires placed entering and exiting the front straight. The initial going was not good for several drivers. Rapp and Vogelsang fell out due to contact while trying to take the first tire and Paiment was also a victim of trying to slow down for the tire. Tyler Peach looked to be a contender before he fell out. The two drivers who seemed to have the best handle on the new format were James Nickles and Dylan Ford. At the halfway point, Ford held the lead but troubles forced him into the pits and off the lead lap. In spite of having significant front bumper damage, Nickles was able to maneuver around the tires and was able to cruise to his first ever feature win. Three other rookies followed in Patrick Sproul, Jake Keeling and Brandon Katri while Ford rounded out the top five. The night in the Fortuna Wheel & Brake bomber division belonged to James Moore, at least for the most part. Moore set fast time with a 18.295 then went on to win the trophy dash. Moore looked to be on his way to victory in the heat but contact between he and Ryan Ahrens sent both cars spinning which handed the lead and the heat win to John Lally. In the 25-lap feature, it only took Moore three laps to get to the lead. At the finish, Moore had a substantial eight and a half second margin of victory over Lally in second place. Matt Simon took third, Jimmy Sorrels fourth and Ahrens fifth. Gary Klinetobe set fast time in the highly competitive Humboldt Hydroponics mini stock class with a time of 19.143. Brian Murrell, Sr. took the honors in the trophy dash while the heat race wins went to Cole Peterson and Brett Murrell. The 25-lap main featured a thrilling duel between Peterson and Jarrett Mayo. The two raced nose-to-tail with Mayo filling Peterson’s mirror yet unable to mount a challenge on the inside line. With five laps remaining, Peterson spun off turn four. Mayo braked to avoid contact with Peterson which allowed Gary Klinetobe to sneak into the lead. Eugene Palmer mounted a late charge as he got by Mayo with three laps remaining but his time ran out. At the finish it was Klinetobe winning his first-ever mini stock feature over Palmer, Mayo, Brett Murrell and Brian Murrell, Sr.
Tommy Payne set fast time for the Thunder Roadsters with a 17.336. Paul Peeples, Jr. visited the Acres for the first time in 2016 and took the trophy dash win while Aaron Byers took the heat race victory. Peeples quickly got the lead in the 30-lap main but had to fight off a hard-charging Ronnie O’Neil all race long. O’Neil had the pace to keep up with Peeples but he did not have enough to put a serious challenge as the gap between the two remained around a car length for the majority of the rest of the event. Peeples margin of victory over O’Neil was a little over half a second. Payne placed third over Donnie Brown and Jett Taylor. Robert Miller looked to be on a mission on the night in the Legends division as he set fast time with a 18.351. Miller followed up his fast time with wins in the trophy dash and heat races. The 25-lap main event was a different story though. Brad Curtice led from the drop of the green and faced the challenge of trying to hold off the faster and more experienced Miller for the win. Curtice was able to hold off Miller in the end as he took the win. Brent Mack and Anissa Curtice completed the field. The night capped off with the thrilling boat race. Fans packed the stands and cheered for their favorite drivers and cars in what proved to be a destructive event. The top three finishers were decided by the noise from the crowd. Brian Murrell, Jr.’s entry was declared the winner over Troy Lee and Tim Roscoe. Racing returns to Redwood Acres Raceway this Saturday night for what promises to be a memorable evening of action. The Mid City Motor World late models will return to the Acres for the Don Graham Memorial Firecracker 100. Following the races, RAR will host a thrilling fireworks show. Gates open at 5:00 PM while races begin at 6:00 PM. It was a special night for Redwood Acres Raceway outlaw kart drivers this past Friday night as the speedway hosted its first ever outlaw kart races during the Redwood Acres Fair. Drivers in the four divisions put on an exciting show for the fans in attendance, many of whom were witnessing their first outlaw kart races ever. Qualifying in the beginner box stocks was paced by Taylor Fuller with a 10.409. T.J. Sorrels was the winner of the dash while the heat was won by Fuller. In the 20-lap main, Fuller got the jump into the lead and was gone from there. The best battle on the track was for second place between Drew Barry and Sorrels with Barry eventually gaining the upper hand in the latter stages of the race. At the checkered, it was Fuller winning by nearly a second over Barry and Sorrels. Jacob Boldway crossed the line fourth while Kai McCrady-Hirsch rounded out the top five. Speedway karts returned to the Acres for the night with Ed Gurbb setting the fast time in qualifying with a 9.991. Nick Davis was the winner of the trophy dash and heat races. The 15-lap main event was dominated in the opening half by Larry Fuller. However on lap nine, Gurbb took the lead. Gurbb was able to pull out to a massive lead and was the winner at the checkered flag by over 3 seconds. Larry Fuller placed second followed by Davis and Lori Fuller. The 250 and 500 karts were combined for another night with Daniel Whitley setting fast time at a 8.511. Redding’s Ken Mahoney won the dash while Sean Fuller took the heat race. Fuller led the opening six laps in the 30-lap main. Brad Curtice took over on lap seven and looked to be dialed in on the night. Nobody was able to mount a serious attack on Curtice even with a few restarts. At the checkered flag it was Curtice taking the win followed by Kyle Whitley, Mahoney, Anissa Curtice and Steve Rambo. Lower Lake native, Dryver Dothage was fast time in the box stock class with a 9.814. Natalie Richard won the trophy dash while the heat races were taken by Brioanna Fuller and Dothage. The first half of the 20-lap main featured a fantastic duel between Richard and Dothage for the race lead. Unfortunately on lap 15, the two collided with Dothage suffering irreparable damage to his kart. The restart saw the renewal of the rivalry between Richard and Fuller. With five laps remaining, Fuller was able to sneak by Richard for the lead. From there on out it was Fuller taking the checkered flag over Richard, Maleesa Miles, Derek Kessler, Jr. and Quintin Ikeya. Happy Fourth of July fellow racing fans. It's going to be a terrific weekend, filled with special shows and fireworks, at nearly everyone of our paved oval tracks. But, before the green flag falls on all of this motorized fun, remember to think God bless America and God bless our troops.Then let's all go racing. KERN COUNTY RACEWAY PARK. 1/2, 1/4 & 1/8 MILE. BAKERSFIELD, CA. www.kernraceway.com SATURDAY, JULY 2ND. More and more this raceway continues to impress its fans with highly innovative racing promotions that perfectly blends in with their high quality racing shows. They're going to prove that point again this Saturday night when KCRWP celebrates the birth of the greatest nation of the World. Under the title of United We Sing, the evening features an attempt set a new record in the famed "Guinness Book Of World Records and 'followed by exciting NASCAR sanctioned racing. The evening concludes with a Salute To America fireworks spectacular. In conjunction with the Bakersfield Board of Realtors, there will be an attempt to break the "Guinness Book Of World Record's" listing for the most people singing "God Bless America" on live radio. The attempted record will be broadcast live by radio station KUZZ, the high powered county music affiliate in Bakersfield. The singing will be led by "American Idol" finalist Amy Adams. Next comes the racing led by the raceway's always exciting NASCAR Late Models. Also on the race agenda are the NASCAR Mini Stocks, the INEX Bandoleros and the Mini Dwarfs which the track management likes to refer to as "the future stars of racing." On Saturday race night the spectator gates will open at 5pm followed by racing at 7pm. The "God Bless America" sing along is scheduled for 8pm. Then the Bakersfield skyline will light up with spectacular fireworks perfectly timed to special music. All in all, it's going to be another fabulous night at Kern County Raceway Park. However, and to no real surprise, they have found a way to make this evening even more special by raising financial donations to local veterans groups. The raceway will pledge $5 of nearly every ticket sold to the following organizations: Wounded Heroes Fund, Honor Flight-Kern County, American Warrior Customs and the California Veterans Assistance Foundation. General admission tickets, age 16 plus, are $15. Tickets for seniors, age 65 and up, kids, age 6 to 15, and active duty military are $10. Kids age five and under will be admitted free. IRWINDALE EVENT CENTER, (IEC). 1/2 & 1/3 MILE. IRWINDALE, CA. www.irwindale speedway.com SATURDAY, JULY 2ND. The IEC will also be celebrating America's birthday Saturday night that will combine the excitement and fun of their famed Night Of Destruction Show with a show stopping fireworks display. All of this American fun is being presented by Pick Your Part and Seidner's Collision Centers. The fun, and potential carnage, from the Night of Destruction will feature the Seidner's Collision Centers Enduro Car Figure 8's, a Seidner's Enduro oval race, Seidner's Skid Plate Racing and Trailer Racing. Bringing some traditional oval racing to the show will be the presence of the Pick Your Part Late Models. Following the racing, it will be time to light up the skies of Irwindale with a show stopping Fireworks display. All of this action will start at 7pm. Adult general admission tickets are $10 if purchased pre sale. Otherwise, on Saturday race day, the tickets will be $15. Pre sale tickets can be reserved via online or purchased at the speedway office located at 500 Speedway Drive. Children's tickets are $5. LAKEPORT SPEEDWAY. 1/4 MILE. LAKEPORT, CA. www.lakeportspeedway.com SATURDAY, JULY 2ND. The skies of Lakeport will also be lit up with fireworks Saturday night. However, that comes following a full evening of racing on this challenging quarter mile paved oval. The speedway will also be paying tribute to a friend when they present the Kelseyville Lumber Deake Ludell Memorial. Providing the racing excitement will be the Taco Bell Bombers, the California Vintage Series, Modifieds, a special appearance from the Northern California Modified Series as well as some sideways entertainment from the Pro Drifters. The spectator gates will open at 330pm followed by racing 5pm. . Fans need to be advised that special event pricing is in effect. General admission tickets are $15. Tickets for seniors, age 60 plus, and students, will valid ID, are $13. Kid's tickets, age six to 11, are $10. LOAN MART MADERA SPEEDWAY. 1/3 MILE. MADERA, CA. www.racemadera.com SATURDAY, JULY 2ND. Madera, California is next on the list to have their skies lit up with a special fireworks show following a full evening of racing. This is the track that goes all out to give their fans more bang for their buck and they have lined up a firecracker of a show to celebrate Independence Day. The on track action will be provided by the Madera Late Models, the Madera Hobby Stocks, the MST's running twin 24 lap mains, the Toyota Sedans, also twin 24 features and the Four Bangers running a 24 lap main. But wait, there's more. Also on the schedule is a Firecracker 40 lap race from the Enduro Extreme Series, a Barrel race, a 40 lap Enduro Sprint race and a special 25 lap exhibition race from the Junior Late Models. The day at Loan Mart Madera Speedway begins with a 2pm practice session followed by qualifying at 315pm, heat races at 445pm and main events at 530pm. Adult tickets are $15 and $13 fir seniors and active duty military. Youth tickets, age six to 12, are $7 with kids age five and under admitted free. LAS VEGAS MOTOR SPEEDWAY BULLRING. 3/8 MILE. LAS VEGAS, NV. www.lvms/bullring. SATURDAY, JULY 2ND. You can best those silver coins jingling in your pocket that the Las Vegas Bullring is gearing up for a big Independence Day weekend. The LVMS will be presenting their annual Night Of Fire this Saturday night with the on track action being highlighted by the NASCAR Super Late Models who will be treating the fans to the Spririt Of 76 - a special 76 lap main event. Also on the excitement agenda will be racing from the Super Stocks, Bombers, Grand American Modifieds as well as the USLCI Legend, Bandolero and Thunder Cars. But wait, there's more. The Bullring is going to add some fun to the Night Of Fire with a waterless boat race, a skid plate race and, you guessed it, a stunning fireworks show. The spectator gates will open at 5pm and immediately begins with a practice session for all divisions followed by qualifying at 6pm and main events at 7pm. General admission tickets are $15. The LVMS Bullring has a variety of options and you can reserve your seats by calling their box office at 800 644 4444. You can also use the speedway's website to order a reserve ticket. STOCKTON 99 SPEEDWAY. 1/4 MILE. STOCKTON , CA. www.stocktonspeedway.com. SATURDAY, JULY 2ND. Let's add Stockton, California to the list of communities who are planning to light up their skies with high powered fireworks following what appears to be a very good racing show this Saturday night. The on track highlight will be the Firecracker 100 from the Pacific Challenge Series which is regarded as being one of the better regional touring series for late model teams. Also on the track will be the Stockton Late Models, bombers, Mini Cups and the Grand American Modifieds. The weekend will begin with a special Friday test and tune session, open to all divisions from 4 to 8pm. Pit pass entry fees for the practice are $40 for all ages. On Saturday race day the spectator gates will open at 5pm followed by racing at 6pm. General admission tickets, age 16 to 59, are $20. Tickets for juniors, age 11 to 15, and seniors, age 60 plus, are $15. Kids ten and under will be admitted free. TUCSON SPEEDWAY. 3/8 MILE. TUCSON, AZ. www.tucsonspeedway.com SATURDAY, JULY 2ND. It's going to be another well staged show at Tucson this Saturday night highlighted by the Firecracker 50, a special main event for the speedway's Super Late Model division. Also on the race schedule will be the Pro Trucks, Modifieds and Bombers. Then add Tucson to the list of race tracks who will be treating their fans to a spectacular fireworks show. The front gates will open at 5pm followed by qualifying at 515pm and racing at 7pm. Tickets are $15 for adults, seniors and military personnel. Tickets for kids are $10. UKIAH SPEEDWAY. 1/4 MILE. UKIAH, CA. www.lakeportspeedway.com SUNDAY, JULY 3RD. How about a special Sunday race to lead you to Indepence Day? Ukiah will be presenting their Bandolero, Taco Bell Bomber, Jammer, Legend and Modified divisions this Sunday. 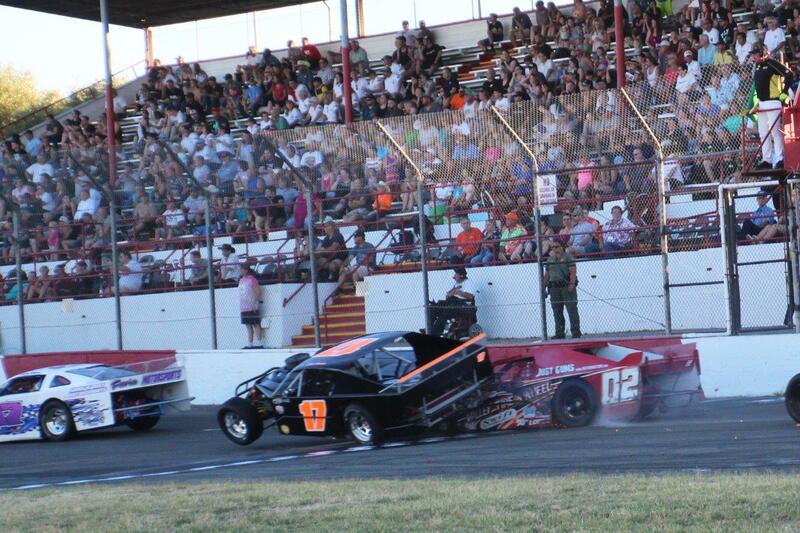 Plus, there's going to be a special appearance from the Northern California Modified Series. All of this action will be followed by, you guessed it, fireworks. The spectator gates will open at 330pm followed by racing at 5pm and fireworks at dusk. General ad$10. STOCKTON, CALIFORNIA (June 27, 2016) - Stockton 99 Speedway welcomes back the Pacific Challenge Series Super Late Models to celebrate Independence Day, with a very special second round of the Tri-Holiday Series. In addition to a great night of racing and fireworks, the race will be the second annual Ron Strmiska Memorial 100. The PCS will pay $4000 to win and should be one of the most coveted victories this year for the touring series. Stockton Late Models will race for 60 laps and $2000 to win as well! Grand American Modifieds, Bombers, and California Mini Cups round out the action-packed night of racing for the 68 year-old quarter-mile bullring on N. Wilson Way. Strmiska was known as the Manteca Missile and also known for his distinctive pink #90 race cars. He won both the 1978 and 1979 Late Model Sportsman track championships and the success transferred to his son Ron, Jr. and grandson Ross as well. Ross Strmiska will be one of many valley drivers competing against the touring stars of the PCS. Jacob Gomes of Manteca is the 2015 SRL champion and 2016 Madera PCS race winner and should be another tough customer. Other drivers with local ties expected include 2014 PCS champion Mike Beeler of Modesto, 2016 Shasta PCS winner Tracy Bolin of Valley Springs, Manteca's JR Courage, and many more. 17-time PCS race winner Jeremy Doss of Upperlake, CA leads the points standings ahead of Beeler, Tracy's Jeff Bischofberger, Bolin, and Granite Bay's Cole Moore. Cole's father John was the 2015 PCS champion and 2015 Tri-Holiday Series champion as well. John will try to get his season back on track as he currently ranks tenth in the standings after six races this season. Former Stockton 99 Speedway track champion Eric Schmidt of Roseville, CA won round #1 of the Tri-Holiday on May 28th Memorial Day weekend. The revival of the Stockton Late Models has been a huge success, with wins swept by Stockton drivers. The series highlight has been a 15 car field on Saturday night in a close race won by Gary Shafer, Jr. Ben Lewis II won the May 28th race while Chad Holman won the season opener on May 14th. 60 laps of competition is on tap for Saturday night! Bringing back the Grand American Modifieds for points-paying action has also been an exciting storyline in 2016. Placerville's Scott Alves earned the victory last weekend ahead of Kris Price and Sammy Solari. Solari claimed the season-opener. California Mini Cups have been busy this year as the youngest drivers at Stockton 99 Speedway. All but two drivers in the division are first year drivers. Adam "The Bullet" Lemke has leaned on his experience to win the first two races for the series with Stockton rookie Joey Stearns running second in both races. John Medina won the first two races for the Bombers but it was Brad Mast getting Saturday's win with Medina relegated to second place. Darrin Adler has had a perfect season with all three races on the podium as these three drivers have made their mark on the class. 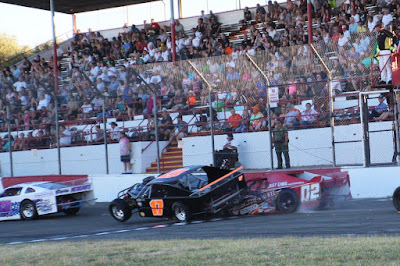 June 25, 2016 - Roseville, CA - The North State Modified Series, presented by Protect the Harvest, returned to All American Speedway in Roseville Saturday night with a record number of 25 modifieds competing in the Sinister Diesel Summer Sizzler 60. The 100+ degree weather did not slow down the competition as five drivers ran in the 13 second bracket with Charlie Collins of Upper Lake on top of the charts with a 13.792 qualifying effort, only .089 seconds off Kris Price's track record of 13.703 seconds. Collins drew a 6 pill for the invert placing Keegan Walmer of Charlotte, NC and Michael Mitchell of Loomis in the front row. Mitchell pulled ahead at the drop of the Buckhorn Bar & Grill green flag with Walmer in second, Rich Lindgren of Rio Linda third, Upper Lake's Charlie Collins fourth and 2014 NSMS champ Jay Linstroth of Citrus Heights fifth. As the field was completing the first lap, Jim Badeker and Sal Lopez were running side-by side when Badeker's car wheel-hopped Lopez's mount. The action sent Badeker air-borne, and when the car hit the track again it shot straight into the turn one concrete. The impact broke the fuel pump dumping burning fuel across the race track. Badeker climbed out of the burning car uninjured as the All American Speedway safety crew worked hard to extinguish the reigniting flames. After a lengthy cleanup, which included a medical emergency in the grandstands, the cars were realigned. Before another lap was completed the yellow flew again when Josh Blackwood and John Baker made contact with Baker spinning in turn four. Walmer pulled into the pits under yellow, relinquishing his second place spot. This left Mitchell and Lindgren sharing the front row, but after three unsuccessful even starts, officials moved both cars to the second row, swapping places with Collins and Linstroth. Collins and Linstroth had a clean start with Collins out in front. Linstroth dove under Collins to steal the lead the following round. Collins' car pushed high on lap five allowing both Mitchell and Lindgren to slip by. Rick Andersen swapped places with Collins on lap 12 as points leader Darrin Knight and Rookie-of-the-Year contender Darrin Sullivan were fighting for sixth. Lap 18 saw Mitchell's car slow, stalling on the track to bring out the third caution. Mitchell was pushed to the pits, ending his bid for the win. The single-file restart gave Linstroth the advantage and once again he took control of the race. Four circuits later Andersen drove under Lindgren for second. Lindgren's car also experienced problems and he pulled off the track on lap 29. The Swartz Diesel half-way mark top ten were Linstroth, Andersen, C. Collins, Sullivan, Knight, Nick Lyons, Richie Potts, Mike Collins, Walmer and Bryan Denton. The second half of the 60 lapper saw Codi Barba, Luke Kaper and Dave Campbell gain positions on Denton, but Denton took the spot back from Campbell in the final rounds. Linstroth held off Andersen to take the win with C, Collins, Sullivan and Knight next across the finish line. Rounding out the top ten were Mike Collins, Lyons, Potts, Walmer and Barba. Linstroth entertained the packed house with a series of spins and burnouts. In the Lucas Oil Dash for Cash Lindgren collected $100 for the win, with Linstroth getting $50 for second. Barba earned the Wenteq Hard Charger Award for starting 23rd and finishing tenth. Charlie Collins took home the Naake Suspension award, and the DJ Safety Certificate went to Mike Collins. The Scribner Plastics went to Andersen and Lyons. Charlie Collins also earned the Penney Racing Supply/Sunoco Fast Time Award. The next North State Modified Series event will be at Ukiah Speedway on July 9 for the Protect the Harvest North Coast 60. SUNOCO/PENNEY RACING SUPPLY TIME TRIALS: Charlie Collins (13.792), Jay Linstroth (13.828), Jason Philpot (13.8693), Rich Lindgren (13.900), Michael Mitchell (13.938), Keegan Walmer (14.005), Rick Andersen (14.042), Bryan Denton (14.072), Darin Snider (140.93), Randy Houston (14.118), Mike Collins (14.126), Cody Thompson (14.129), Darrin Sullivan (14.132), Richie Potts (14.142), Nick Lyons (14.195), Darrin Knight (14.198), Jim Badeker (14.206), Sierra Furia (14.237), Luke Kaper (14.244), Sal Lopez (14.364), Dave Campbell (14.474), Josh Blackwood (14.669), Codi Barba (14.712), John Baker (15.069), C.J. Christman (N/T). ROSEVILLE, CALIFORNIA (June 25, 2016) - Cameron Park's Jason Romero is now two-for-two in PCS competition at Roseville, taking Saturday's 100 lap feature during the Placer County Fair at All American Speedway. The win during the sixth round of the Pacific Challenge Series presented by PenneyLawyers.com also makes him the only repeat winner this season. In similar fashion to his victory on April 16th, the three-time All American Speedway champion hounded the leader until a late race maneuver. He has only led a total of 20 laps en route to the two victories. 17-time PCS winner and incoming points leader Jeremy Doss of Upperlake, CA led the field to green after winning the American Racer Tire dash. The dash also paid $500 to win. Doss got out to a comfortable early lead while Romero navigated from fifth starting position to get past Cole Moore for fourth. The race had a straggled start that allowed the top eight cars to pull away from the rest of the pack. Romero worked his way past 2015 PCS Champion John Moore of Granite Bay for third and closed down on Shasta race winner Tracy Bolin before the caution flew on lap 19. The caution was for a slowing Jeff Bischofberger, who dropped from the race with power steering problems. That yellow flag proved to be the only stoppage in the fast paced 25 minute feature. Bolin and Romero battled for second place for several laps with Romero finally taking over that position on lap 25. With Romero in second, the stage was set for a tremendous battle for the race win that thrilled the crowd. John Moore fell out of the competition on lap 34 to continue a rough 2016 season for the driver dubbed the "Iron Man"
Romero applied the pressure on Doss while Cole Moore got around Bolin for the third position. Bolin would anchor a train of cars with Mike Beeler and Matthew Wendt that ran together to the finish. Doss encountered lapped traffic by halfway which brought Romero onto his rear bumper. The race was on from there. Romero looked high and he looked low in a suspenseful race where the pair may have never once touched. Romero decided to make his biding on the outside line, but the door was shut by Doss on the exit of turn two at least half a dozen times. Finally the battle hit its crescendo when Romero dive bombed Doss into turn three for the lead on lap 85. Doss slowed dramatically in anticipation to set up a cross over attempt but Romero was able to drive away. Romero took off with the race for a nearly two second victory ahead of Doss, Cole Moore, Beeler, and Bolin. Hayward's Danny Malfatti won the Penney Racing Supply Hard Charger winning a great race with JR Courage to finish ninth. The second annual Ron Strmiska Memorial 100 at Stockton 99 Speedway continues the PCS season this Saturday night, July 2nd. $4000 will be awarded to the winner in what also makes up the second round of the Tri-Holiday Series. For more information on the Pacific Challenge Series, visit them online at www.PacificChallengeSeries.com or on Facebook and YouTube.